As we head toward St Patrick’s Day we thought we would share the “Shamrock Map”, by John Clark Malone, 1950. This is a highly stylized word map showing place names having Irish influence [Map Rm-s] ISLZ 912.73 UN50M (1950). It is one of the many interesting illustrated maps we have in our Indiana Collection. 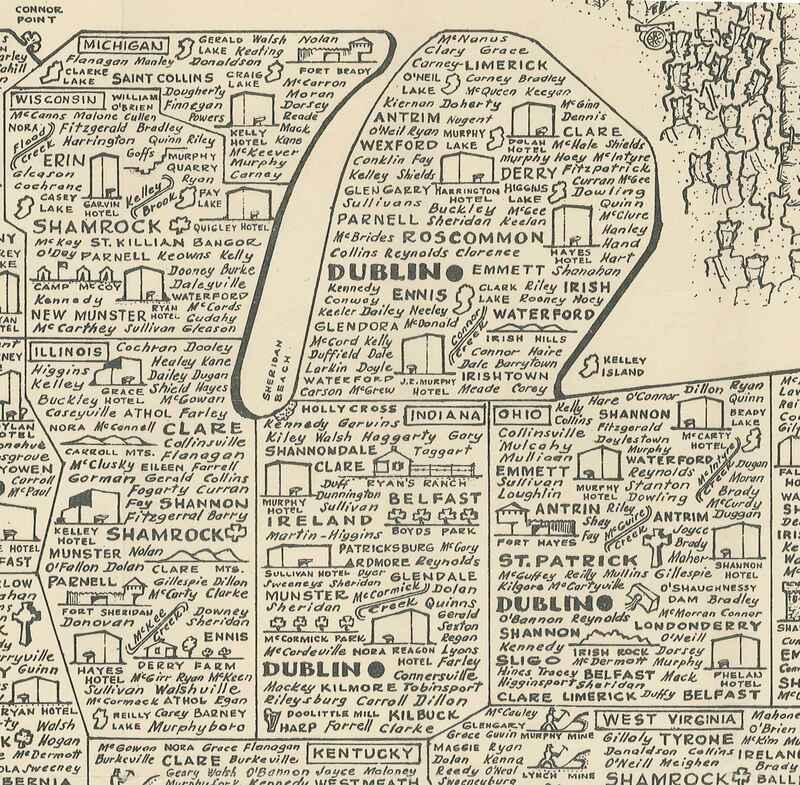 Within Indiana, Dublin was printed with the strongest visual pull having been made bold by the artist, perhaps as a tribute to the Irish capital city. According to the 1995 book “From Needmore to Prosperity: Hoosier Place Names in Folklore and History” by Ronald L. Baker, there have been two Dublin towns in Indiana, one in Parke County and one in Wayne County. The Dublin in Wayne County has two alternate stories surrounding its naming, both being a play on the word ‘doubling’. The first story recalls how wagons would have to double team their horses to get through a muddy spot along the National Road –doubling up the horses. The other story credits the name to the famous Huddleston House Inn, which had double doors. In all likelihood, the name was simply derived from the Irish city. This blog post was written by Monique Howell, Indiana Collection Supervisor, Indiana State Library. For more information, contact the Indiana Collection Division at (317) 232-3670 or “Ask-A-Librarian” at http://www.in.gov/library/ask.htm.